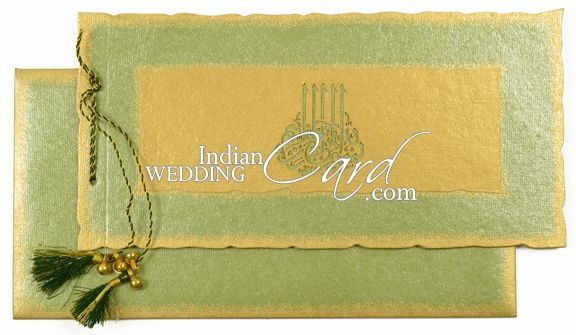 Card is elegantly designed as a Pothi (an ancient book). 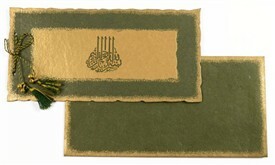 Laser cut “Bismillah” on golden paper adorns the front of card. 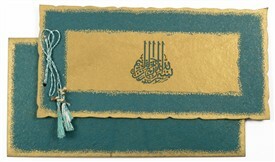 Inserts are cut in beautiful curvy shape like banana leaf with gold border on edges and are tied together with tassel. 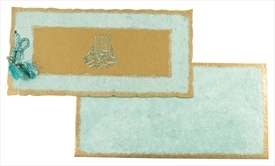 The envelope too has the golden border. 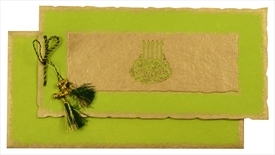 Shimmer light green handmade paper (250 gsm) for envelope and 3 inserts tied with matching tassel. Golden handmade paper (250 gsm) pasteup on front.